I'll never understand the need or the pleasure of shopping on a holiday. 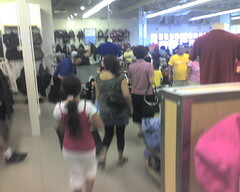 It's hot outside and crowded in the stores. People *think* they're getting great deals by shopping on holiday weekends when retailers "slash prices." In actuality they're not, when they figure in the time, effort and gas money used to get to the shopping centers and all the time spent waiting in lines. I prefer hitting the outlets during "obscure" times when the crowds are smaller and service is better. Hear hear. Shopping in SoHo today was pure suckage.